All FLIR® infrared camera software allows fast, detailed and accurate analysis and evaluation of thermal inspections. It enables users to work more efficiently and productively by providing them with the most professional camera-software combination. Every FLIR thermal imaging camera comes with software that allows users to organise and analyze the images from their thermal imaging cameras and present them in an easy to interpret report. The software allows for adjusting image settings such as colour palette, level and span and for basic thermal analysis. 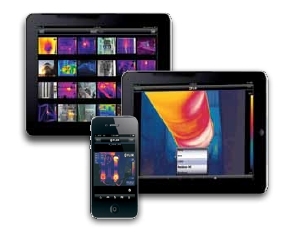 Users that need more advanced analysis tools can opt for FLIR Reporter. Along with the of our standard FLIR Tools software features, new FLIR Tools+ provides an expanded set of cutting-edge controls for generating more comprehensive thermal imaging inspection and research reports. Record and playback radiometric video files and time/temperature plots. Build a radiometric panorama image. Use Microsoft Word to quickly create a report. And provide advanced analysis data and more detailed thermal imagery in impressive PDF documents that show anomalies, trends, and results with greater precision. 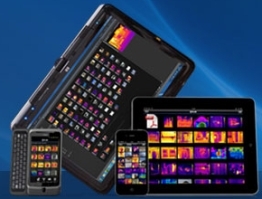 FLIR leads the way with forward-thinking Wi-Fi connectivity to Android and to iPad, iPhone and iPod Touch devices. Just download the new FLIR Tools Mobile App from Android Market or from the App Store and you're ready to see, capture and import thermal images as well as to stream and capture live video from select FLIR cameras. FLIR Tools Mobile can also be used for remote control of the camera. An intuitive and easy-to-use online tool to evaluate infrared images. You can upload images, create, move and delete measurement tools, change palettes, read out camera properties, and more. You can also save the changed images to your Desktop.